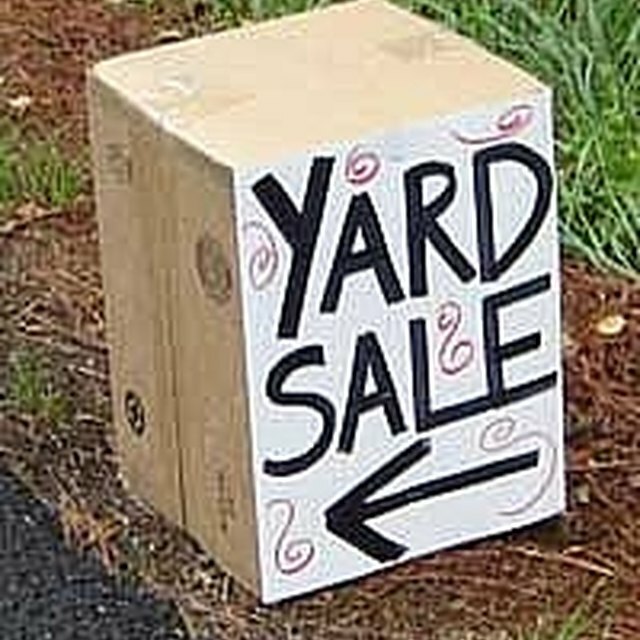 A yard sale is a great way to recycle things you no longer need and make some money at the same time. It can be overwhelming, though, to plan a sale, set it up, sit outside all day, handle customers and then take it down. For a successful sale, plan ahead and enlist the help of a family member or friend. Give yourself plenty of time to sort and price your items. Look through your unwanted possessions and decide whether you have enough items to hold a sale. If not, ask friends, relatives or neighbors to join your sale. Even if you plan to only sell your own items, arrange for a helper. Set dates for your sale several weeks in advance. If you want to hold the sale for more than one day, check local laws to find out how long and often you can hold a sale. Check your insurance policy to determine whether you are covered in the event of an injury on your property. Clean sale items that are dirty. Locate cords and accessories that typically go with an item. Check electronics to see whether they work. Use small stickers to place price tags on unique items. For similar items or things that might be damaged by stickers, make a price sign. For example: "All hardcover books: $1 each." Make a master list of your items and prices in the event tags get lost. Store the items until it is time to set up the yard sale. Advertise your sale in the local newspaper, community bulletin boards and online social media a few days in advance. Include the address, time of the sale and a brief description of items. Before you post any signs along a street, check local laws. In some places, you cannot post a sign on a utility pole, traffic sign or tree, or within a certain distance from the street. Ask permission before posting a sign in another person’s yard. How Does a Tag Sale Work? Obtain tables, racks and hangars to display your items. If you plan to use your garage for the sale, clean it up and put away any items that are not for sale. Get coins and small bills to make change and a fanny pack to hold the money. If you use a cash box, make sure it is always attended by you or a helper. Gather newspapers to wrap fragile items and bags for customers to carry their items. Make a plan for disposal of items remaining after the sale. Place your items on the tables and racks shortly before the sale. Arrange tables to allow sufficient room for customers to walk around. Set up a table for customers to set down their items and pay for them. Decide whether you will allow any customers who arrive before the official start time to browse or make purchases. When the sale opens, greet your customers and enjoy your sale.